A client recently told me this and while he was referring to a finical situation, this holds true in the fitness industry as well. While I love barbells and dumbbells for heavy strength training, but they don’t make up the majority of my clients’ fitness programs. I like to use multiple tools to get the job done, and depending on the goal and the job at hand, some pieces of fitness equipment may be more beneficial than others. Three of my favorite fitness tools are kettlebells, suspension trainers like the TRX and my personal favorite, your own bodyweight. 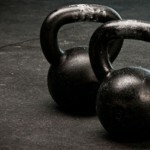 I like kettlebells not so much for what they can do, but for what they can’t do. 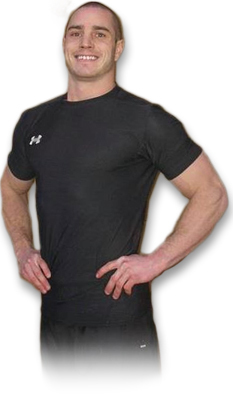 It is hard to perform insolation exercises like triceps kickbacks, lateral raises and calf rises with kettlebells. These are not bad exercise by any means, but I like to start and usually stick with compound total body exercise like squats, deadlifts and push presses that utilize the whole body to burn fat and improve athleticism at the same time. Also, because of the handle, the weight is much easier for most my clients to hold. For people not accustom to lifting weights, kettlebells can be less intimidating and allow people to work harder than they might otherwise. 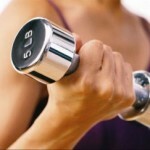 Recommended starting weights for beginners are 9 pounds to 18 pounds for women and 18 pounds to 35 pounds for men. I would also highly recommend gradually adding volume over time to avoid any overuse injuries. Suspension training is a different take on strength training that uses a system of ropes and webbing, called a suspension trainer, to allow the person to work against their own body weight. The freedom of suspension training allows for movements in all directions, not only front-to-back and side-to-side, but rotational movements as well. We move every day in these three different planes, and rarely use muscles in isolation. These training devices allow you to integrate more muscle groups at once and in a way this represents real life activities and sports. It is also easy to make any exercise harder or easier through small changes in body position relative to the anchor point, or by changing your base of support. 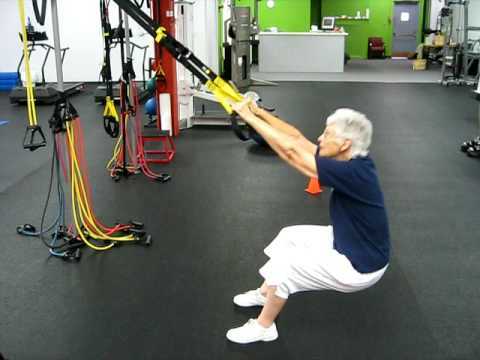 A 70-year-old grandmother can practice squatting holding onto the handles to make the exercise easier with the support of a trainer. Without making any adjustments to the equipment, a 23-year-old football player can get a great strength workout by placing one foot into the trainer squatting with a kettlebell or dumbbell. This makes it a good tool for both beginners and more advanced athletes of any age. My favorite is the original yellow and black colored TRX. While not technically a piece of fitness equipment, before kettlebells, dumbbells and TRXs people trained using their own bodyweight. Although this type of training developed out of necessity it has stood the test of time. Bodyweight training goes back 1,000s of years and was the chosen training method for the Greeks, Romains, Navy SEALS and has been a consistent component of nearly every military organization from past to present. The biggest disadvantage to bodyweight training is that it is perceived as too easy for the experienced trainee and too hard for the beginner. However, with proper exercise execution and knowledge it is possible to develop a bodyweight-only training program to fit anyone’s needs.